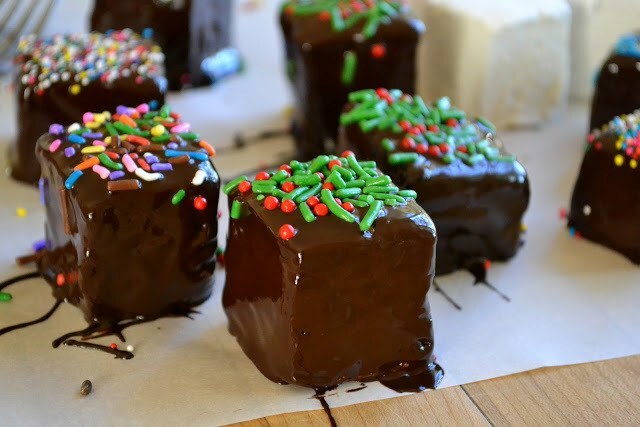 These festive little chocolate covered marshmallows are so easy to make even the kids can get involved. They turn plain hot chocolate into a decadent treat. Chop the chocolate into small pieces. Put in a glass microwave safe bowl and microwave for a minute. Then stir, and put back in the microwave for 15-second intervals if necessary until it is smooth and completely melted. Set a marshmallow on the tines of a fork, and dip it into the chocolate, A spoon helps to get all the surfaces covered. Let the excess drip off before setting it down on parchment or waxed paper. Scatter the wet chocolate with sprinkles, if desired.